NCC-TU Group Outing on the Gunpowder a Success! Here’s my report for our group on this past Saturday. After leaving the Shop, we split up between Masemore and Falls Rd. Believe it or not, the river wasn’t that crowded and the weather really cooperated- cloudy but hardly a drop of rain. From what I hear, just about everybody caught fish, althoughI think the high point must be the young man who was on his third fishing expedition with his grandfather who caught four fish. Your advice and hospitality were crucial to our success, both as to location and fly selection (mostly sulphurs and caddises), as well as general encouragement. This entry was posted in fishing report on April 29, 2012 by Theaux Le Gardeur. Thanks to Evan for the stream report from April 27 and reminding all of us that the Gunpowder and rising wild fish are an easy drive (before 3:00 PM mind you) from BWI. Yesterday I had a few hours to spend on the Gunpowder after landing at BWI mid-day. Your website fishing report was right on.There was a modest Sulphur hatch going on but I experienced it from 2pm until 6 PM. Also Midges were coming off the entire time. I had my best day ever on the river as far as sheer volume of fish and every one of them took my little Catskill style dries. I lost count after awhile, haha. Next time I get up there I will be sure to stop by the shop. This entry was posted in fishing report on April 27, 2012 by Theaux Le Gardeur. Thanks to Mike for the kinds words and for shopping where he gets his stream report! Thanks again for your help today with the waders and boots. It’s nice to have a fly shop with knowledgable staff so close to the city. I’ve attached a link with all the info regarding the mt. Hood climb. This page covers gear, what to expect on the climb, rates, etc. It really is a great climb during the spring. Feel free to drop us an email if you have questions on the climb or gear. This entry was posted in news on April 25, 2012 by Theaux Le Gardeur. After some much needed rain in the area this week, the Gunpowder River is clear, flowing at a near perfect 104 Cfs and is 53 to 57 degress throughout the catch and release section. With Hendricksons on the wane, Sulphurs have been reported peeling off mid-morning from Masemore through Bunkerhill. 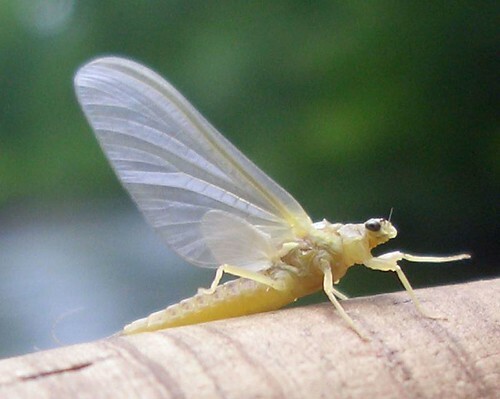 While we have not seen enough mayflies to have a concentrated spinner fall yet, this hatch is close to two weeks early and bodes well for early season dry fly fishing. Start with Mike Bachkosky’s Sulphur patterns from the muffin tins in the #14 range-we have a variety of snowshoe rabbit duns and emergers and just received a number of Catskill style dries that skate and tumble just like the naturals. Nymphing is still tough-owing to the amount of Didymo, but swinging emerger patterns and unweighted pheasant tails is a nice way to cover water this time of year. 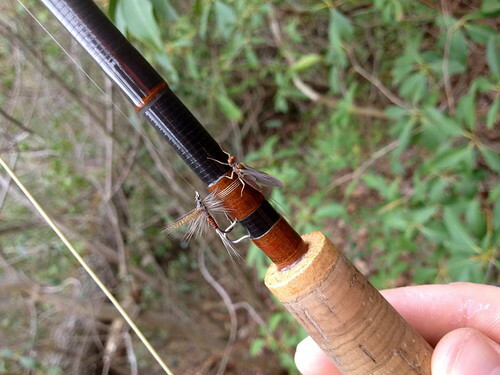 Be sure to check the fly regularly to make sure you’re not fishing a dreaded algae emerger. The lower river has been recently stocked with bright, hatchery rainbows (downstream of the Gas line between Corbett Rd and Upper Glencoe through Lower Glencoe, Sparks and Phonix Rds is closed till the morning of the 28th. The upper river in the catch and release section through the Hereford area of Gunpowder State Park and Blue Mount Quarry stretch and the two fish a day, wild trout section from Bluemount Rd downstream to the Gas Line is open year round and supports a wild, sustainable population of Brown trout. You mentioned that there is a stocking this weekend. I am keen to have another go. Are you working in the shop Saturday? If so, I will drop in to restock on flies (several ended up in overhanging trees!) and get some advice on other spots to try out. Thanks again for your help. You made it an really enjoyable day. This entry was posted in fishing report on April 25, 2012 by Theaux Le Gardeur. Please join us for a fly fishing school. On Sunday, April 22, a Backwater Angler Guide will be teaching a fly fishing school that is ideal for beginners. If you’re planning on flyfishing Maryland, or anywhere else for that matter, this course is a great introduction to the sport. The school covers knots, casting, gear and fly selection. Class is held from 11:00 AM till 2:00 PM. Cost is $100 per person and includes the use of gear. A Maryland non-tidal fishing license and trout stamp is required and may be purchased at the shop with check or cash the day of the school. Class size is limited to 4 and pre-registration is required. Please give us a call at 410-357-9557 or drop us a line at info@backwaterangler.com to pre-register. This entry was posted in events on April 17, 2012 by Theaux Le Gardeur. Please join us for a fly fishing school. 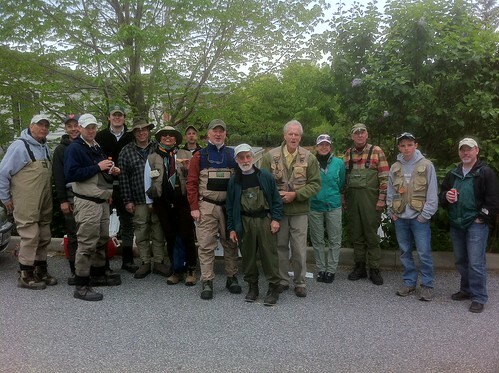 On Sunday, April 15, a Backwater Angler Guide will be teaching a fly fishing school that is ideal for beginners. If you’re planning on flyfishing Maryland, or anywhere else for that matter, this course is a great introduction to the sport. The school covers knots, casting, gear and fly selection. Class is held from 11:00 AM till 2:00 PM. Cost is $100 per person and includes the use of gear. A Maryland non-tidal fishing license and trout stamp is required and may be purchased at the shop with check or cash the day of the school. Class size is limited to 4 and pre-registration is required. Please give us a call at 410-357-9557 or drop us a line at info@backwaterangler.com to pre-register. This entry was posted in events on April 10, 2012 by Theaux Le Gardeur. On opening day for the Orioles, Hendricksons and Olives are the Twins that are creating quite a stir along the Gunpowder River. The Gunpowder River is flowing at a near perfect 94 CFs, is clear and 54 F. Die-hard nymph fisherman are still beyond frustrated with the Didymo that continues to foul their rigs. Long leaders in the 6x to 7x range have been necessary to trick midging fish in the mirror smooth flats between Masemore and Falls Rd. Downstream of the gas line, the lower river was recently stocked with hatchery rainbows and it has been easy enough to fool these bright fish with streamers and heavily weighted nymphs. Thanks to Mike Colegrove for the great shot of Josh Reider’s favorite Scott G2 with a Hendrickson checking out one of Mike Bachkosky’s Catskill Style Red Quill patterns. This entry was posted in fishing report on April 6, 2012 by Theaux Le Gardeur.